Eighth graders wrapped up their eight-week Endangered Species Project right before Spring Break. This interdisciplinary capstone project culminates in a presentation to a panel of teachers and parents. The top eight presenters gave their presentations to the entire grade in the theater. 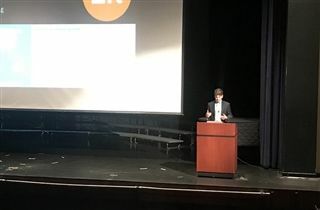 This year’s finalists were Megan Delande, Mya Collins, Daniel Bronfman, Monica Mahoney, Lyba Masroor, Jordan Goldberg, Evan Jahn, and Hugh Kuffner, who was recognized as the best overall presenter. Congratulations to these students and all our eighth graders on reaching this academic milestone!